I obviously focused on modeling and shading probably because I was kind of tired of animating and rigging. 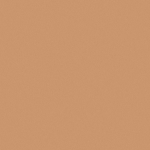 Plus I really wanted to model something complex like human and attempt to shade it. 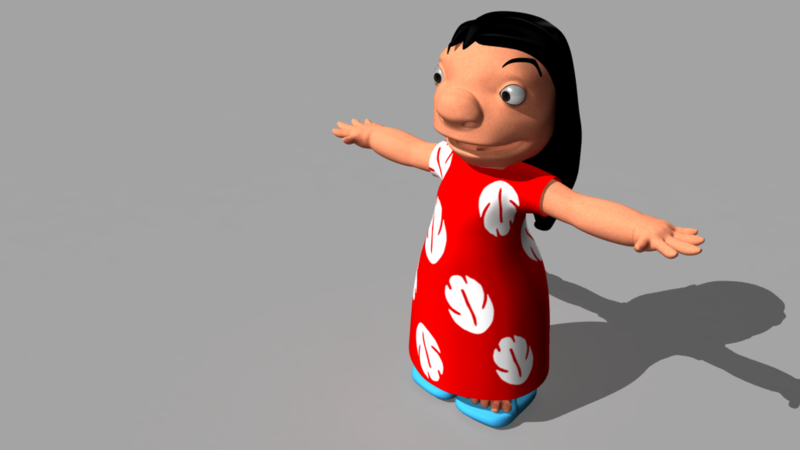 So I went with Lilo – complex but not too complex because she still lacked a details in terms of realism (ie, no nails). She was also one of my favorite characters growing up: stubborn and loyal. And I really love the way Chris Sanders draws females. Digital-Tutor’s Create A Stylized FemaleThis was the closest thing available to help keep my topology in check. Obviously the character difference made it difficult, but the best part about the tutorial was that it didn’t already have awesome reference images that they used to model the character exactly. It helped me look closer at various images and come to an executive decision on how something on her should look (which was really hard for me because I was always changing things). This was the hardest part. 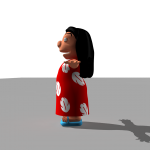 I swear, Lilo was never drawn completely from the side or the front. It was always 3/4ths, and there was always something I wasn’t sure about. So, like the ears, they ended up being too far back and too far in…but it looks good in 3/4ths which was what most of my references were in. As said, the 2D to 3D was hard. It left me uncertain, but the DT tutorial definitely helped fill in gaps and keep the topology sane. 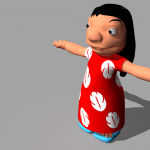 Lilo looks flat in the dress, but without (swimsuit reference), she still has that curvyness traditional to Sanders’s style but toned down because she’s a kid. So I wanted to keep the curves, which I may have exaggerated now that I think about it. 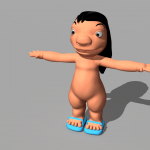 Everything either started off as polygons and then shaped, or extracted from the main polygon.The least thing I liked about the model is the hair. 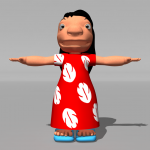 Lilo’s in 2D was flat and not soft at all. It’s hard to do that in the way I approached the hair. It didn’t make sense for it to be flat, so the model ended up looking way softer. 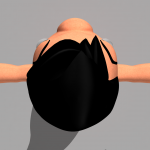 Also, it ended up being kind of fudged more…so the topology in the hair, I’m not so proud of. And inside the mouth as well. The part that I liked the most were the hands and feet, actually. She didn’t have really any details to them or nails, which was perfect (for me). 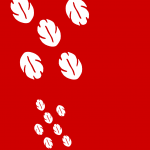 They weren’t elegant or skinny like the tutorial’s model, so I wanted to emphasize their roundedness and curvyness. I’m pretty happy with how they ended up. Skin: I chose one of the skin colors off of a colorized Lilo picture, and added noise to it in Photoshop. It ended up kind of making her look a bit plush-like, I think, but I do prefer with the noise than without. It adds an extra depth to it. 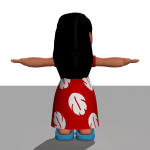 I followed the same cheat that the tutorial used for faking a sub-scattering effect on the skin as well, but I didn’t actually take the time to layout the skin UV because the character was simple enough that she didn’t really need it. Everything else was kind of done according to the tutorial, especially the eyes. Disclaimer: This project was done solely for educational and non-commercial purposes. Lilo and Stitch is a trademark of Walt Disney Pictures.